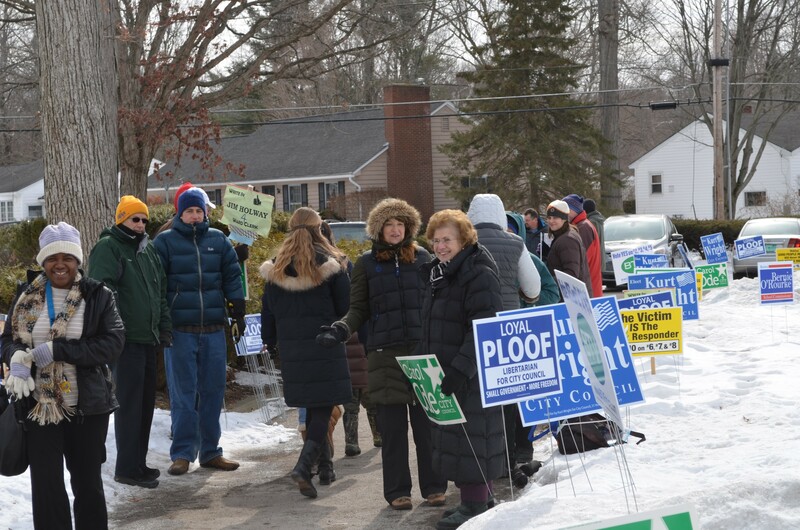 Voters brave the cold outside the Ward 4 polls. For the first time in more than a decade, Burlington voters rejected the school budget put before them. There were murmurings, leading up to Town Meeting Day, that the mounting frustration among property tax payers might finally take its toll at the polls. The speculation proved true: by a margin of nearly 700 voters, the $66.9 million budget proposed for fiscal year 2015 failed. "I’m disappointed," said Burlington superintendent, Jeanne Collins. "But," she continued, "I feel that’s the democracy in voting. The message to the school district and the school board is that we need to reevaluate our programs and determine what is affordable. It’s important to listen to that message." The budget itself was proposed to increase by just under 4 percent. But due to other factors in the statewide education finance system, the tax rate for Burlington property owners was forecast to rise almost 10 percent. The two New North End wards, which saw higher turnout than the rest of the city at least partly due to hotly contested city council races, rejected the budget by the largest margins. Two camps — exasperated taxpayers and residents concerned about cuts to school spending — said the budget drove them to the polls. “It’s just not sustainable,” said Sheryl Felty, who lives in Ward 7. Since fiscal year 2010, the budget has risen $17 million, which marks a 34 percent increase. Felty said she recognizes that the Burlington schools face challenges requiring additional resources — supporting English language learners and students with special needs, for instance — but said state officials need to hear the message that taxpayers are maxed-out. The seven other ballot items passed. Drivers on North Avenue could see a sail on one side of the street, disembodied from any boat and planted in the snow. It marked one of the last-minute efforts of a number of private developers and public officials who campaigned hard for voters’ approval of an ambitious set of waterfront projects. Mayor Miro Weinberger’s Political Action Committee, Partnership for Burlington's Future, also went to bat for the plan. Residents approved the redevelopment package, which requires that the city take on $9.6 million in debt. The vote was 5,366 in favor to 2,317 opposed. The priciest and highest-profile piece of the plan is the $26 million proposal to turn the defunct Moran Plant into a multi-use facility featuring restaurants, a performance space, and a maker space, among other components. Other proposals include creating a permanent location for the Lake Champlain Sailing Center, building a marina, expanding the ECHO center facilities and upgrading Waterfront Park. The plan relies on tax increment financing — future tax revenue that is expected to pay for the debt Burlington incurs to help fund the projects. Some voters said that while they weren’t totally sold on the project, they decided to support it because it wouldn’t increase their tax burden. Sue Brooks, a Ward 4 resident, said she voted for the proposal. Al Brooks, her husband, voted against it, explaining that he’d prefer to have open space where the Moran Plant currently stands, and he doesn’t buy the argument that renovating the plant will bring in revenue to the city. “He’s a fiscal guy, and I’m kind of a dreamer,” she said. The other three items promoted by the Partnership for Burlington's Future PAC also won approval. Ballot-casting residents decided they could stomach the proposed 3 percent increase in the general city tax rate. That item passed 3,957 to 3,580. City officials said the increase, which will allow them to hire 10 new positions and pursue “cost-saving” measures. The Burlington Electric Department (BED) got the go-ahead to make a long-awaited purchase: a hydroelectric dam that spans the Winooski River. BED estimates that the facility, called Winooski One, will supply eight percent of the city’s energy needs. At the polls, voters by and large expressed enthusiasm for acquiring a local source of renewable energy, and they approved it, 5,945 to 1,498. The “yes” vote should bring closure to BED’s decades-long endeavor, which involved a legal dispute with the private company that constructed the dam over whether Burlington was entitled to purchase it. Voters signed off a $12 million bond that will finance the bulk of the $16 million price. The remaining $4 million will be paid for with money originally set aside for the McNeil Generating Station. Voters also proved amenable to a redistricting plan, which took the 14 city councilors more than two years to agree upon. It passed 4,419 to 2,742. The plan reconfigures the city wards into eight wards, instead of seven, each of which will elect one councilor, rather than two. In addition to the wards, the arrangement divides Burlington into four regions, which will also send one councilor each. The plan would reduce the total number of councilors to 12. It is scheduled to take effect for the March 2015 election, but the state legislature needs to sign off on it first.